Antidote was created by taking aim at all departments of health sector and by strengthening it with hundreds of features. All parts that come together with the template are compatible with WordPress shortcode and Visual Composer structure. Therefore, we can promise that you will not come across with any surprises while building any page that you imagine. All pages of the template are built with the shortcodes which include hundreds of properties and you can easily build as many different pages as you like. We have built a plain and apprehensible page for you to introduce your therapists, and you can add anything you want to this page. If you have several clinics in different cities, you can also add them with the map and other shortcodes in the same way. 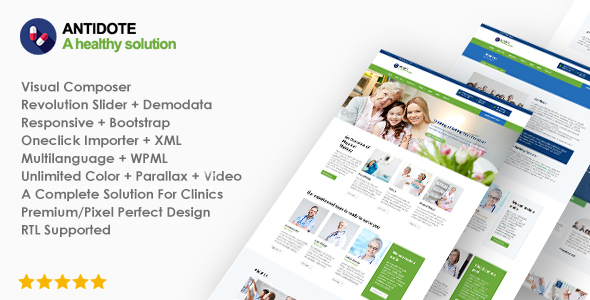 As a WordPress theme, Antidote can be used in all medical and healthcare sectors ( Sports therapy clinics, Physical therapy clinics, Hair transplantation, Rehabilitation clinics, Physiotherapists, Chiropractor, Home care assistant services, Respiratory therapist, Massage therapists, Chiropractic expertise, Nutritionist, Psychiatry clinics, Psychologist, Home Health Care) as well as in the domains of different business sectors owing to its strong infrastructure.